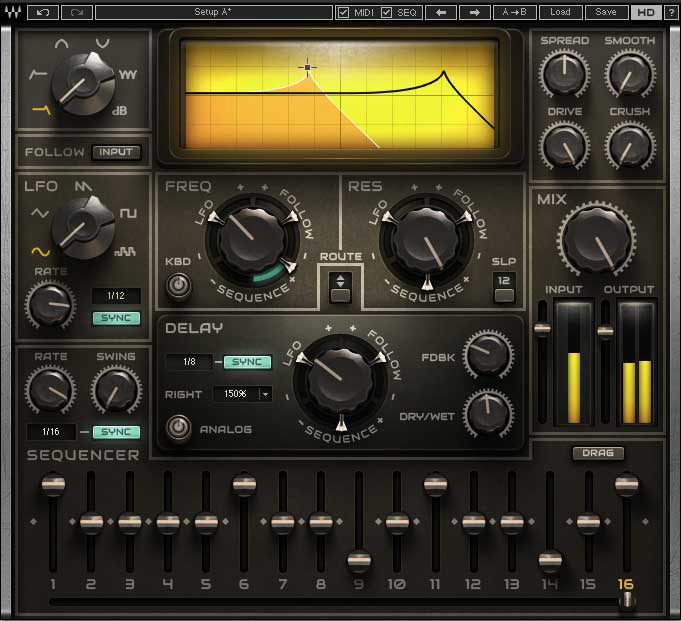 Designed around a multimode filter with extensive modulation options and powered by Waves’ Virtual Voltage technology, Waves MetaFilter has everything you need in a sound-shaping filter plugin. The versatile MetaFilter creative effects unit provides all the warmth, depth and fatness of classic analog filters, along with the modern control and endless flexibility distinctive of Waves tools. MetaFilter lets you individually modulate the filter’s cutoff, resonance and delay time using three separate modulators – a 16-step sequencer, an LFO, and an envelope follower with a sidechaining option – making it easy to achieve effects such as filter sweeping, tremolo, auto wah, rhythmic gating, ducking, and hypnotic modulating delays with saturation buildups. With intuitive controls that are inviting and enjoyable to use, you can effortlessly customize and program your own presets. Thanks to its easy-to-use MIDI Learn capabilities, MetaFilter can be controlled from any MIDI control device – a great advantage for live DJ performances. Moreover, when MetaFilter is connected to a MIDI keyboard, the keyboard can actually be utilized for playing the filter cutoff. Whether you’re creating rhythmic loops and tracks from sound bites, adding a subtle effect to a guitar part, or simply mangling a vocal track just for the fun of it, MetaFilter’s versatility and endless possibilities make it the ultimate tool for creating and producing innovative, eccentric and cutting-edge music in the studio and on stage.